Try a unique alternative to a typical night out in downtown Boston with an exciting dinner cruise along the city’s waterfront. 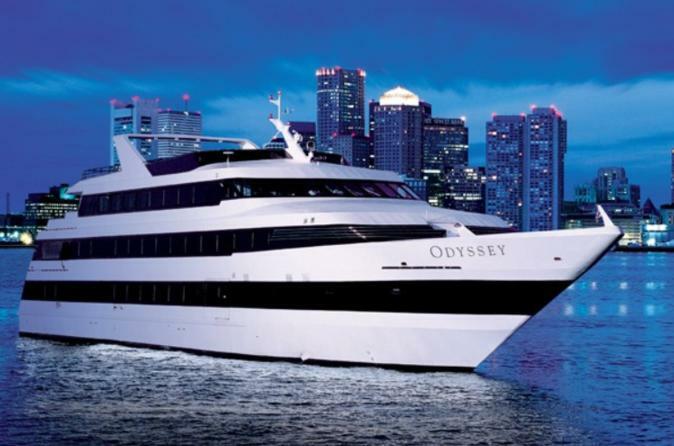 This 4-hour expedition on Boston Harbor features a three-course meal with live entertainment and dancing. Take a stroll under the stars and enjoy the view of the illuminated Boston skyline at night or head to the dance floor for music and fun in the ship’s nightclub. Bring that special someone for a night to remember. Make your way to Rowes Wharf in Boston, where boarding begins at 8pm for a 9pm departure. After boarding the ship, you'll have the option to pause with the ship’s photographer, if desired, then the captain and crew will greet you. Enjoy some time to mix and mingle before settling into your seat at the ship's cabaret-style tables. There are three climate-controlled interior decks with panoramic windows, so you'll have a perfect view of the Boston skyline as the boat gets underway. Enjoy an elegant, three-course dinner of a tasting trio appetizer, entree, and dessert, with the option to order pairings from a great wine list (wine own expense). Enjoy live performances throughout the meal, then head to the rooftop lounge and observation deck to check out the skyline, or hit the dance floor with an interactive DJ spinning top-40 hits from a variety of genres. See if you can spot some of the top Boston sites that you'll pass along the way, including Zakim Bunker Hill Memorial Bridge, the historic USS Constitution, and Boston’s thriving Seaport District. This four-hour cruise concludes at the original departure point.